However, this is a page of items made FOR China! 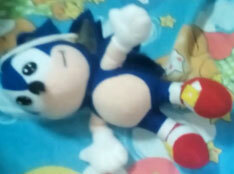 There are so many people who live there, that it just has to have a fan base for Sonic as well. The way to tell Chinese things apart, is usually by looking at the text. While Japan uses some similar word items (a kanji) China only uses kanji-like word items. These look complicated & are easy to spot in most cases. Also, keep in mind a lot of bootlegs come from China too...but REAL manufacturers aren't afraid to use copyrights, trademark-symbols, and say who the licenseor is. With a little bit of looking you can probably spot even more items. This page will have a mix of older & new items. 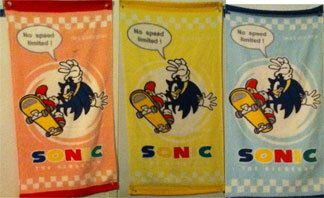 This is a big beach-size towel for Sonic X. 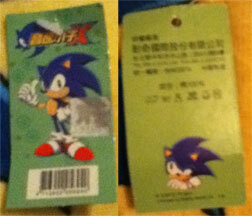 Notice how complicated the Sonic X title looks when it's written in Chinese. The "X" is the same but that whole rest of it is the title. The towel has rings, stars, & colored dots. 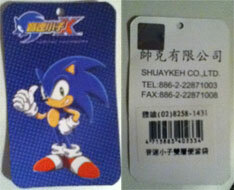 The tag has the license info, & likely price barcode. To the right, you can see the size of the towel as it hangs from 2 hangers above a collection of Sonic stuff. 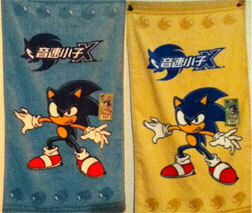 Here are 2 towels for Sonic X. They both have the same graphic, but the 'yellow' one is actually more of a beige color. Little Sonic heads decorate the top & bottom. They're about 21 inches long. 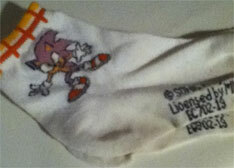 Here are 2 pairs of Sonic X socks. The first is new with the tag on it (see the little logo) as well as a small sticker. The blue theme is nice, with thumbs-up Sonic. 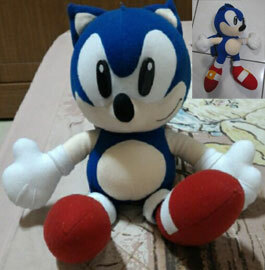 The second pair (same pose as the above towel) has been worn...and washed...and so the blue dye on the threads for Sonic has faded to a strange color! Some dyes fade more easily than others, so keep in mind while washing & wearing. 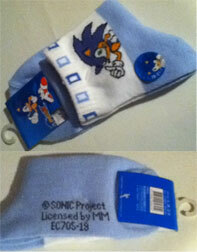 These are "Sonic Project" items (you'll recognize that from quite a few other X items) licensed by "MM" which stands for "Mighty Media" who also did some of the towels. These are adult sizes, between 5 - 9 , so anyone can use them. Here are 2 Sonic school supplies. At left is a soft-sides insulated lunch bag, & at right is a rolling backpack. 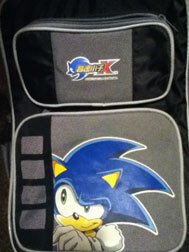 They both have a Sonic X theme, & seem to be good quality plastic/canvas. The 3 lines on the side are for name/ personalization in case it gets lost. 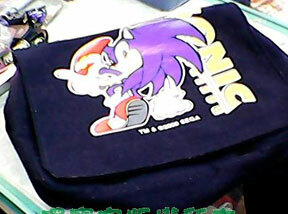 The art used for the rolling pack is rather cute, as Sonic looks somewhat confused. It's a rare shot of him from the show. Notice the logo in Chinese...quite complicated/distinct from the JP one. Lots of things seem to be made in China, but these were made FOR China, so they're interesting to see. Photos & owned by AskLiliumLily. 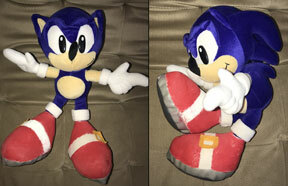 Here are 2 old Sonic plushes from the company "News Power". This company is in China, but then also (Seems to) have only sold their stuff there as well. 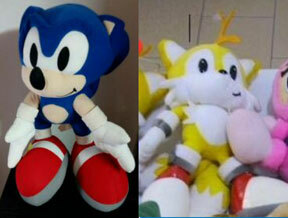 These are older 90s era plushes from when it wasn't recognized how Sonic's spikes went, so everyone was just doing the 3 rows of felt strips right in the middle. (Like Caltoy & etc in the USA too) It apparently came in 2 sizes big, and medium (inset). 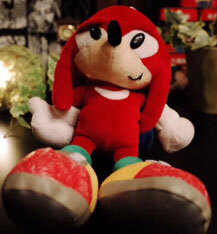 News Power did make a Knuckles, though he doesn't seem as common. He's classic, but the body shape isn't that great, it's more square with a thick waist. 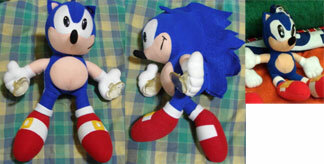 The fists are a little small, but the head shape & face seem ok. Notice his feet though: the fabric is cracked/flaking. It was made from that "leathery feel" light-weigh fabric that has some plastic-ish coating. Clearly, they didn't use a high quality version of the stuff and it's gone bad over the years. 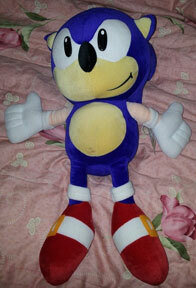 This is News Power's largest Sonic doll. 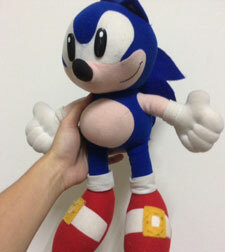 After News Power's largest doll comes their smallest Sonic. This messenger bag is by News Power. Above: Plasti-coated fabric can crackle and flake off with age or light exposure. 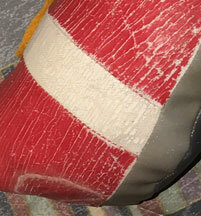 Like the 'big shoe' dolls, they also used a type of plasticoat fabric to make the shoes shiny/fancy looking....however because the material wasn't 100% quality at the start, it didn't age well. The crackling you see at the top occurs whether the doll is stored properly or not. Sometimes conditions can trigger it early but it depends on the quality of the fabric the company chose most of all.